This month’s focus has been the yukata (summer kimono). After completing a small mock up, these last two weeks have been about a full-size piece. It isn’t finished, but close enough for the moment. The first week was spent dyeing all seven pieces to the garment: 2 front and backs, 2 sleeves, 2 overlaps and the collar. Each piece was manipulated uniquely and then dyed. At this point, all seven pieces are attached, but it is long and unwieldy. It’s bulky (because of the cloth type), wider, still than it really should be…still, I rather like the way things came together with the hand stitching. Yet, in the near future, I may take it apart to make some adjustments. There’s much more to this garment than anticipated. 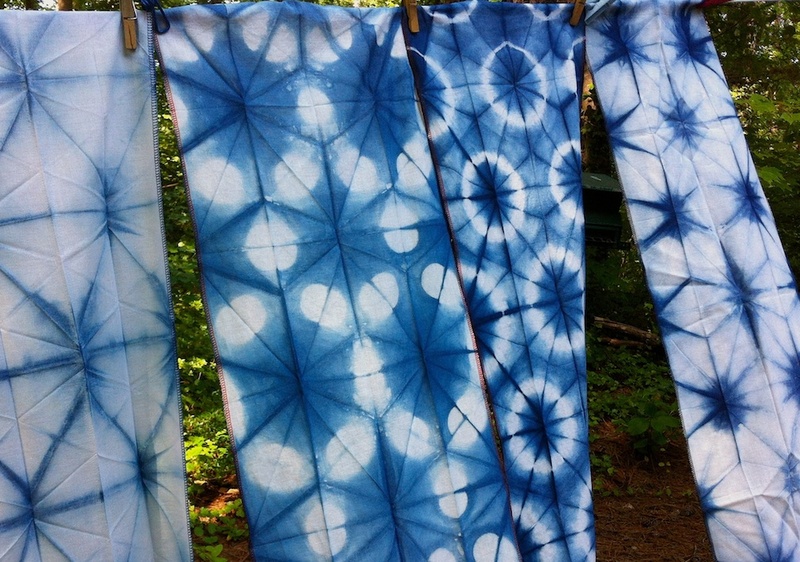 And as we are now looking into September, I invite you to consider the weekend shibori workshop (Upcoming Workshops page) coming in the latter part of the month. It can be as intense and serious as you want, but I think fun is a necessary ingredient. 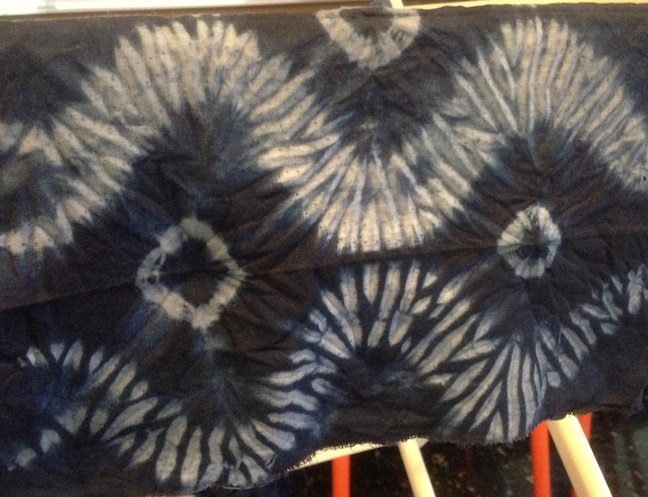 It’s about indigo, it’s possibilities and beauty, as well as shibori. The photos don’t do these pieces justice – the nature of things. However that is, these below and many more, reflect simplicity and sophistication. 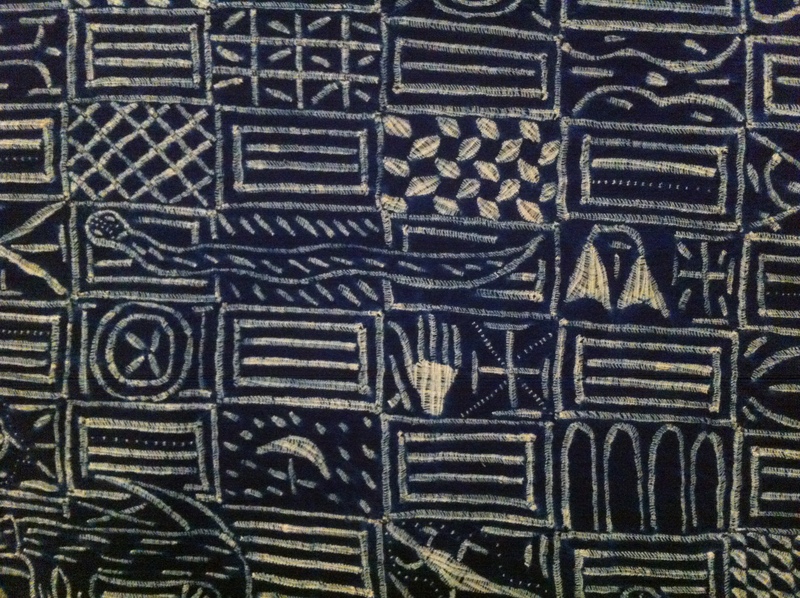 It wasn’t completely about the indigo, but about technique and the engineering behind pattern making – what could be done by hand with the aid of a tool. I never cease to be amazed at the invention that takes place. There is without a doubt always a new approach. These were just a very small sample of class results that took place at the museum last weekend. You’ll find more images here. Needless to say, this is one very content sensei. I considered squeezing in a few words at the week’s end last week, but time did not permit. That’s one way of putting it. It was fortunate that the first week of our (Janine’s & mine) workshop came the eve of a major family event in Tampa – the enjoyment of class fed right into the rest of the week. Results of this first week were pretty fabulous I thought and an understatement. The participants worked only with itajime (board clamping), folding, clamping and dipping. Each piece was amazing and something new. Students/participants, though, are also in the same category – so perhaps not so surprising, but still…and so inspiring! Then those weekend events… which took me back to Tampa, one of our family homes – grandmother’s (grandfather’s & great-grandmother’s) and so, was one of our “bases” when we came back to the “states” – and many other connections. 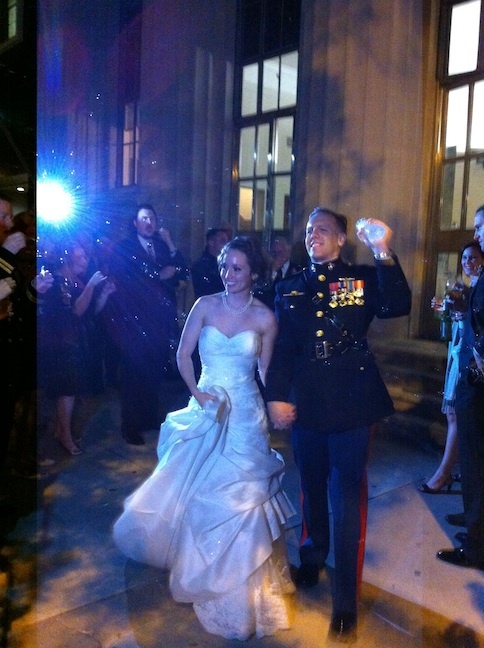 This time it was another fabulous family wedding – another niece (I have quite a few) – a new nephew. All of my siblings and many of their children attended, so it was a memorable and significant event. Mother shared family pictures I hadn’t seen before, my brother shared his nature photos (I’m inspired by them), we told stories that probably resolved a few “mysteries” and so much more. I’m glossing over it, but needless to say, I’m glad I was there. That question was posed on the Gregg Museum’s facebook page where I found it first thing this morning. So I thought to add my own “reply” or comment – it’s an opportunity to learn about the materials and the process. It’s an opportunity to experience it, hands on. The image, a detail of one of those richly patterned cloths now on exhibit, contains the kind of imagery we could easily reference in this upcoming class. 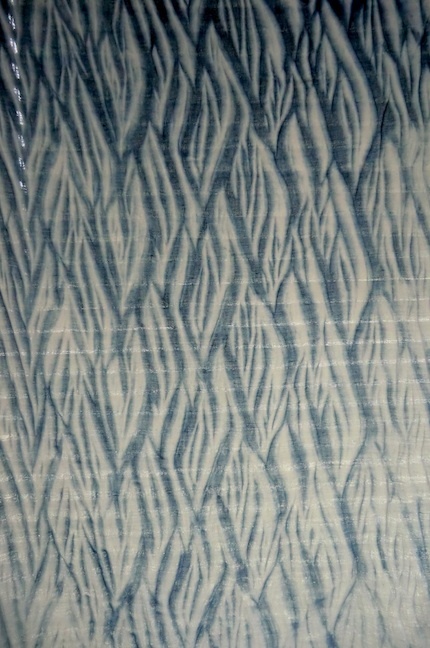 The resist technique used in this piece is universal throughout the many cultures that have used (and still used) in their textile pattern making. 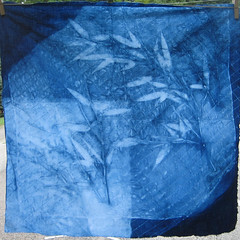 Janine and I would be delighted to have you join us as we consider our explorations in indigo dyeing and shibori. Supply fee of $60 due at the first class. It’s time to register. Hope you’ll join us at Pullen Arts in October. We look forward to to seeing you! It may be a bit early for this announcement, but then again, folks are planning ahead for autumn, so perhaps it is time for considering something like this. Once again, Janine LeBlanc and I are teaming up for a series of classes in the fall. They will be held at Pullen Arts Center While classes are not available for sign up yet, they will be beginning July 30. 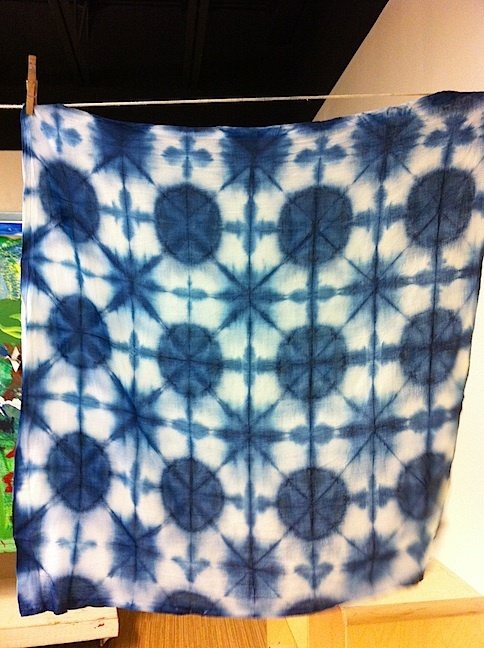 That makes a total of 10 class hours to explore various aspects of shibori and indigo dyeing. This also gives opportunity for students to practice their new skills in their personal studios and then return to the workshop for more challenges (we hope!). As I know more I’ll continue to update on my blog and also will put this same information on my “Workshops” page. So, dear reader, if you have any questions regarding the class, please don’t hesitate to ask. Indigo in the Blue Ridge Mts. How long has it been since I’ve been in the mountains? I cannot really remember…but as usual, I was reflecting again on that faraway place. It doesn’t really take much, especially in summer. We (my family) used to take August for a month in the mountains (Japan) nearly every summer (in childhood). We had a small rustic cabin in the woods, on Lake Nojiri. There were cooling breezes, insect song, muddy paths along a rice paddy (somewhere in there), fogs that rolled in on the lake and much, much more. I was looking forward to similar when we went up to Glendale Springs. It wasn’t quite the same, of course, but evenings were pleasantly cool with thick fog and it rained nearly everyday. I missed the beetles and cicada, although we had some fat bumblebees. To be able to mix those memories with indigo worked just fine. It was grand, actually. Many, many thanks to our hosts and fabulous participants. Yep. That’s what one student said…it’s all true. Give in and do it…that is to say…do that “aizome” (indigo) thang! I mean really. That’s how I’m feeling today after a weekend in the mountains working with 7 students and Janine as my assistant, manager, and co- teacher (although she doesn’t see it that way). I’m just taking a few minutes before running off to Artspace this a.m. to comment. Links and images are “popping up” on my horizon…can’t really ignore or just wait until later to comment. It was a relaxing, refreshing weekend with a lot of inventive, innovative people. They took the ideas and ran with them. That’s what you want to see. “A Greener Indigo” about Barbara Shapiro’s work with a non-toxic, environmentally friendly vat, in this summer’s Fiberarts magazine naturally drew me. So, recently, I made up a small vat and have begun experimenting with it. I’m sure it has its contexts, as I’m finding. I was lukewarm at first. This image is a detail from a piece of fabric that was sitting in my garage for quite some time – waiting for the right dye to “appear” – and I think it finally did. It’s tempting to take the same ingredients down to Beaufort this coming weekend. I wonder what the participants there would make of it?